Welcome back from the weekend. Hope you had a good one! It’s officially February (woohoo)! How are your New Years Resolutions coming? Mine are going great…well, some of them are at least (we won’t talk about how many times I’ve been to the gym). But, let’s get onto today’s digital freebie—it’s a good one! 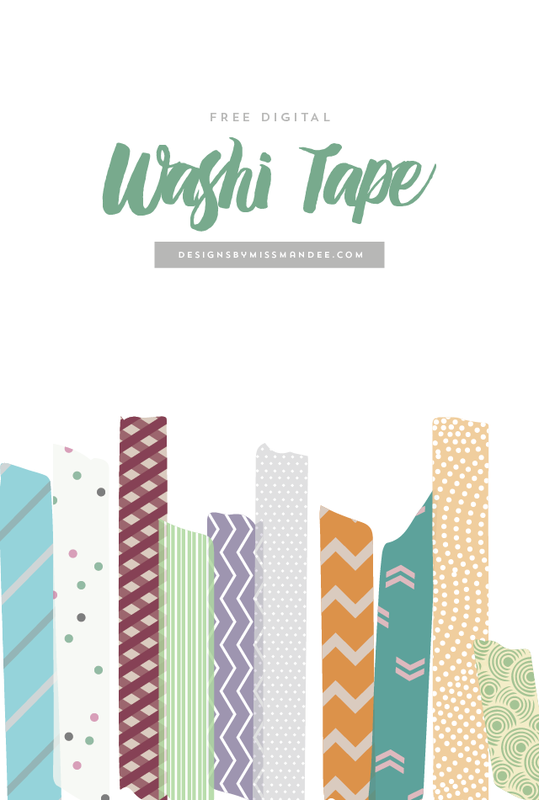 Free digital washi tape for all your crafting needs. Who doesn’t love washi tape and all its million and a half uses? It’s so fun, and it’s a really easy way to make something look cute and crafty in an instant (I’m all about quick and easy craftiness). Well, these washi tape strips are no different. Use these in your digital scrapbooking, labeling, or as photo overlays. These beauties would also be a great addition to a blog logo or used as dividers in a post or sidebar—so many possibilities. What do you think you’ll use them for? Feel free to share your projects with me, I love to see the creative things my readers do with my graphics! And, if it’s digital freebies you like, then you have come to the right place! I’m constantly sharing cool stuff on my blog. Last week, I shared some beautiful hand drawn numbers as well as some lovely desktop wallpapers. Be sure to subscribe to my blog to get awesome new freebies every week! It’s easy, just submit your info in the footer. So, whether you have a project in mind, or you’r just feeding your graphics hoarding addiction, I hope you enjoy your new graphics. Thanks so much for stopping by Designs By Miss Mandee, and good luck getting to the gym this week (maybe I’ll see you there). Popping over from Totally Terrific Tuesday =) I collect digital washi tape like it’s my job. Do I use it? Nope. I pretty much just look at it from time to time =) Be sure to share your crafts & DIYs at Two Uses Tuesday (Mon 11pm EST to Fri 11pm EST) over at Sarah Celebrates if you don’t already! Hahaha! Love it. I too collect WAY more graphics than I will ever use. Free things are just too fun to pass up. 🙂 Thanks for stopping by! I love it! Washi tape is my weakness, but I’ve never used digital tape before. Adding these to my collection and thanks for sharing! I know, isn’t it so fun?! Thanks for stopping by Meredith! Thanks so much for stopping by Denise! I’m a Washi Tap newbie. I actually just bought my first 23 rolls today! haven’t used them yet, but I have plans! I’ve never even heard of digital Washi Tape though…awesome!!! Thanks for this and for sharing it on #TheWeeknedRetreatParty! These are ADORABLE! While I am admittedly addicted to real washi (my collection is embarrasingly awesome) I cannot wait to use these!! Great resource; thank you so much for sharing this! Your graphics are always awesome! Thanks for sharing at Totally Terrific Tuesday! I hope you stop by again this week. The party starts at 10pm! Thanks for sharing at the Tater Tots & Jello link party! I always loooove free graphics 🙂 Have a nice week!! Yay! I’m so glad that you’ve found my blog useful Peggy. 🙂 Congratulations to your Daughter—that’s so exciting!!! That’s awesome that you’re going to be designing her invitations. In answer to your other question, I would suggest buying Photoshop to get you started. If this is going to just be a one-time design project though, you can use PicMonkey for free. It’s fairly simple to use, and I have a couple of tutorials you can check out to get you on your way under my “Downloads” tab. Let me know if you have any other questions! Thank you so much Mandee!!! I’m not sure how complicated this will be. I hope you don’t regret offering your help, LOL! BTW Mandy, I don’t have any graphics on my computer to create the invitation. What do you suggest? I’m sorry for misspelling your name Mandee! Really, really, really Thanks for sharing! These are awesome, thanks so very much. Thank you so much for this wonderful washi tapes! I really appreciate them. I’m gonna be using them for my school project. Thank you so much!